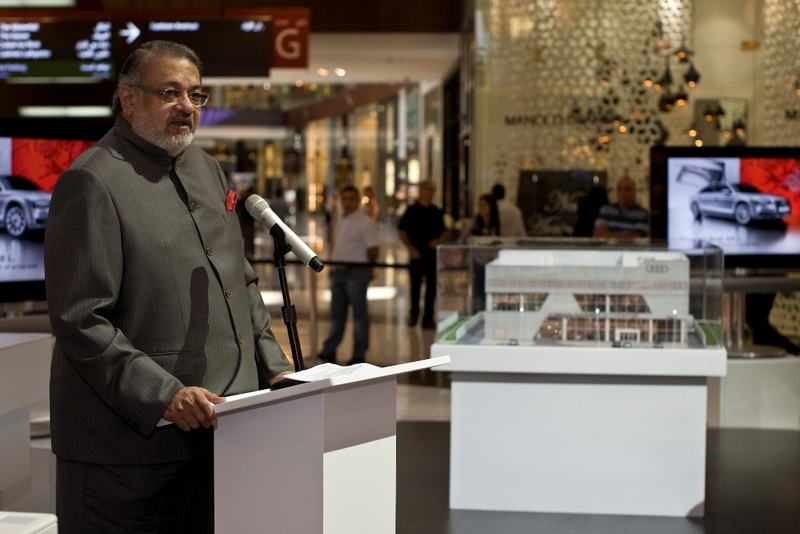 Dubai, November 25, 2010 – During the press conference for the launch of the new Audi A8 L Al Nabooda Automobiles made the surprise announcement of a brand new Audi showroom being constructed on Sheikh Zayed Road between second and third Interchange. The new building designed in the state-of-the-art Audi “terminal” showroom concept represents an investment of AED 100 million. It will comprise 94,000 square feet of showroom- and office space on three floors with space for 61 display cars as well as dedicated areas for Audi exclusive customization, fleet customers, a prayer room as well as a kids’ area. The Dubai Audi terminal is thereby the world’s largest in terms of the number of new cars on display. A panoramic passenger lift as well as an escalator connects the three floors. The trend-setting architecture also integrates delivery areas where up to five cars can be handed over to their new owners at the same time. The terminal’s architecture embodies the sportiness of the brand in emphasizing the dynamics of the curve – especially in the presentation areas and windows. The aluminum facade reflects the Ingolstadt premium car maker’s expertise in lightweight design. “The new Audi terminal in Dubai will be the most visible sign of the Audi brand offensive and our comprehensive and future-oriented line of products”, declared K Rajaram, CEO of Al Nabooda Automobiles. The Audi terminal, designed by local architects in coordination with the Audi terminal Competence Center (AtCC) in Ingolstadt/Germany, is scheduled to open in the second half of 2012. Other Audi terminals are already in place in Sydney, Tokyo and Mexico City and over 350 Audi terminals worldwide are to be built by the end of 2012.